Dice "Tools of the Trade"
Our selection of Dice Tools of the Trade is ideal for serious Craps Players and others who need to determine the preciseness of their Casino Dice. Choose from the Casino Dice Tools detailed below (for Razor edge Casino Dice, visit our Precision Dice page). Dice Caliper –This Balancing Dice Caliper lets you determine whether your Casino Dice are properly balanced to ensure that no sides of the dice are favored. Pocket size at 4" long x 1-1/2" high. Dice Indent Punch –Our Dice Incident Punch is used to mark or cancel monogrammed/customized Precision Dice. 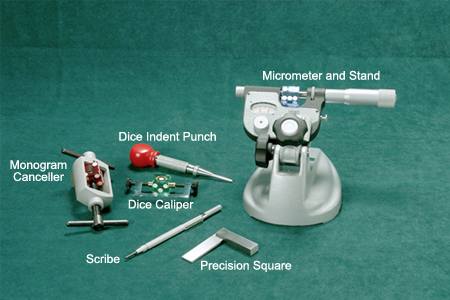 Dice Micrometerv –Measure the size and accuracy of your Precision Dice with our Dice Micrometer to ensure that no sides of the dice are favored. Includes Dice Micrometer Stand. Dice Precision Square –These Precision Squares are used to check the squareness of Casino Dice. Dice Scribe –This tool is used for marking and checking Casino Dice. Dice Monogram Canceller –Tempered aluminum contruction used to "Cancel Out" the stampings or logo on dice. For additional information on our Dice Accessories, or to get a Free 104 Page catalog, please contact us at 1-800-233-0828. You also might be interested in our Casino Dice, Dice Cups, and our Professional Casino Dice Cancellation Drill.